A biogas digester is required to make biogas. A biogas digester (anaerobic digestion plant) is a sealed container holding water and bacteria, which is fed organic matter to be broken down, and which collects the resultant biogas. The biogas is tapped off from an inverted drum or plastic membrane collector, either to a collector for storage, or directly for burning. The most popular use of burning is for cooking fuel in the developing nations, and electricity production in the developed countries. The average amount of biogas made for every kilogram of waste put into the digester is half a cubic metre, enough to power a light globe for about 90 hours. Biogas digesters are among the interesting solutions to meet the energy demands for cooking and lighting, and at the same time taking care of kitchen wastes in developing countries. Millions of simple unheated small scale biogas plants are currently used on small-scale livestock farms in developing countries with warm or hot climates. Most of these simple AD plants are used to produce energy for domestic purposes from anaerobic digestion of animal manure. In the developed nations, if well implemented, a biogas digester can power a whole community out of their own organic waste by digesting their sewage works sludge at their sewage works, and from agricultural waste such as manure, and crop waste, plus grass and straw fermentation, etc. Having said that a digester can help every community, and overall, civilization can become a more environmentally friendly society by adopting the process wherever possible. They are normally brick or masonry built and buried underground to achieve a more stable internal temperature. They are generally constructed using local materials such as clay, sand, pebbles, and bricks, which makes them affordable and promotes local self-reliance. When they are buried in the ground in cooler countries (in subtropical areas), low temperatures may restrict biogas production in the winter , especially in mountainous areas. When the biogas digester is not in a tropical country and un-insulated there is an increase in temperature fluctuations as a result of heat transfer from the environment in and out of the digester through the double wall brick structure of the traditional brick built biogas digester. Insulating the biogas plant is a way to ensure a high enough average temperature, and to minimize the fluctuations which can disrupt the methane producing organisms. It works just fine in hot countries. But, in subtropical climates this has been found not to prevent low temperatures completely, even if the biogas digester is built underground. For this reason biogas digesters in cool climates must be built from more expensive higher tech materials. They are built as large tanks, often in steel with extensive corrosion protection. These tanks are then heated using waste hot water from the cooling systems needed when the biogas is used to fuel gas engines which generate electricity. A home biogas system can be used to process kitchen waste (as stated earlier), animal dung and (as long as precaution are taken to ensure the output is pasteurized) human waste (local sanitation codes permitting). 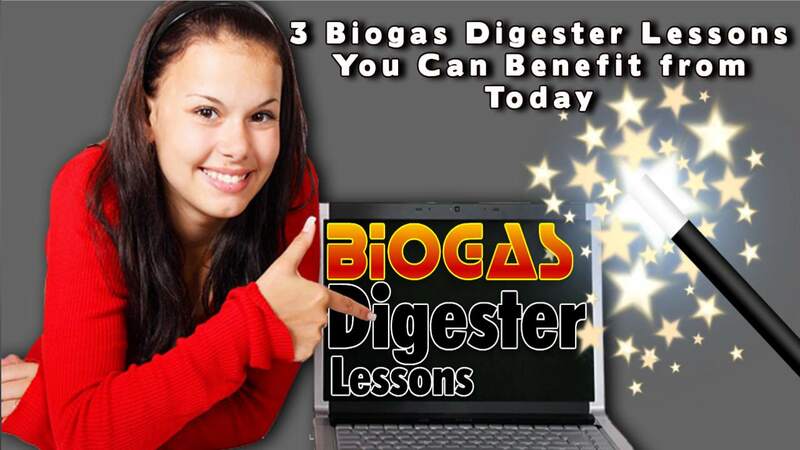 The biogas digester can make use of almost any organic material that can rot. Some materials are easier to digest than others. Food waste makes some of the most biogas per unit mass, and manure the least. Theoretically, the CO2 emission reduction by a rural household biogas digester can be as high as over 100% of the emission if the energy had been derived from a fossil fuel, if the energy saving in using digestate to fertilize the next crop instead of chemical fertilizer is also counted. All governments which have signed up to the Climate Change Agreement (Paris Accord) are able to use the emissions reductions available from the process, to comply with their targets for the reduction of fossil fuel use/ carbon emissions reductions. The cost of installing a biogas digester can sometimes be paid back within only a few years, through the savings and benefits they can bring about. What is more; They can not only produce heat, cold and power, but also serve as the conditioning point of waste produced by various agricultural and food industry sources so that when spread on land the wastes cause less risk of polluting water, and odours are greatly reduced. They not only provide energy. Both the liquid slurry and the sedimentary sludge from biogas digesters are rich in nutrients, minerals, and biologically active compounds that form an excellent organic fertilizer. The outflowings are called digestate. Fibrous materials in digestate improve the soil structure, allowing it to hold more water. This reduces erosion during storms and the amount of water needed to keep crops growing can be reduced by the additional moisture held in the ground after rain. Flooding is even reduced when enough organic fibres in the soil as are present as this organic material can reduce “hard panning” of soil surfaces which result in a lack of ability of the ground to absorb water during storms after dry periods. This reduces flash flooding. Not wishing to be left out, household biogas digesters are becoming popular in the developed nations. In essence, biogas digesters are simply a wet, warm to hot, enclosed compost pile which is carefully fed manually and daily with fresh organic waste feed materials. – One of the most practical and cost effective ways to generate alternative, sustainable and environmentally friendly energy. The development of modern AD plant technology has increased the number of anaerobic digestion systems significantly over the past two decades and approximately 200,000 biogas digesters are currently in operation, just in Vietnam alone (Department of Livestock Production, 2010). 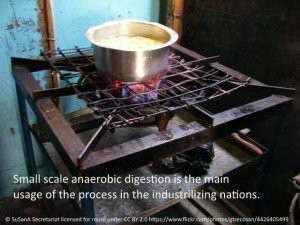 We have hardly touched the surfaces of the advantages of biogas digesters, but we hope that by reading this article you will begin to understand the importance of the anaerobic digestion process which is at the heart of every biogas digester, due to its cooking fuel production and environmental benefits.